The sky monsters are starving, you must feed them blocks (or else)! Kamikaze Blocks puts the power of physics in your hands. Launch your dynamite dudes at explosive, toxic, triple-bomb and other classified blocks to feed the creatures of the sky. Beware of obstacles as you progress through 2 Worlds and 100 levels of challenging puzzles. Use precision and advanced physics to accurately shoot the dynamite dudes and emerge victorious. Chains, ramps, seesaws and MOAR (yes, moar)! Unlimited ways to beat the game, hours of fun! After you compete Puzzle World move to Arcade World where you have infinite shots and earn medals. Go for the Gold, Silver or Bronze as you complete each level to earn the highest score with the least amount of shots (think golf). • Complete with 2 worlds (puzzle & arcade) 30 levels! 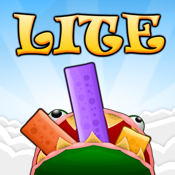 • Hundreds of obstacles, levels and dynamic blocks! • Updates are definite, rate KB today! Please rate Kamikaze Blocks in iTunes, and leave a review...we love to read feedback! Your 5-star iTunes ratings and reviews will get us to launch updates! Over 5,000,000 plays online, this flash hit will entertain and amuse. Guaranteed.